Welcome to our first blog post from Central 4/5! Our names are Alison and Liora and we've been working with the great kids of a Central Public School 4/5 classroom since October. Topics we have already covered with the kids are nutrition and hygiene. For teaching about nutrition, we focused in on healthy foods vs. ‘sometimes’ foods and portion control. As an activity, the kids drew their favourite healthy meals on paper plates and we all took turns presenting! The classes that we taught hygiene were related to puberty. One fun activity that we did with the kids was when we talked about the importance of washing hands! 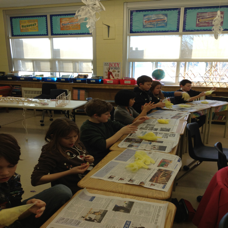 The kids wore rudder gloves and we gave them a dab of paint, which we all pretended was soap! The kids then pretended to wash their hands, covering their whole hands with the paint! They were amazed at how hard it is to cover both hands with 'soap'! The kids always have amazing questions, and whatever we do not have time to answer in class, we let the kids write their questions in an anonymous question box and we answer all of their questions at the beginning of the following class. 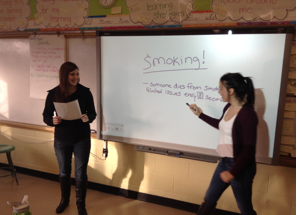 In the next few weeks we are excited to be teaching the kids about a topic that they have not been taught in school yet- smoking cessation and tobacco! Topics that we will cover include second-hand smoking, ingredients in a cigarette, and addictive properties.